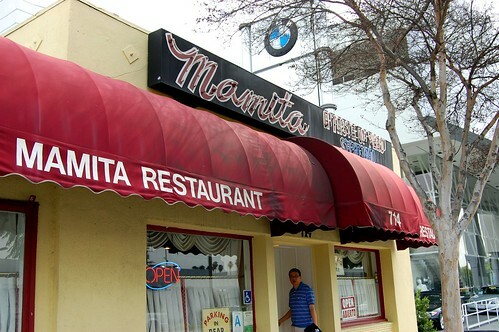 It's a given that, when we take Big Red to be serviced at the dealership, we eat at Mamita's Peruvian Restaurant (714 S. Brand Blvd., Glendale, (818) 243-5121) while we wait. We've gone enough times that we've developed favorite dishes. Even so, I figured I'd take some photos since I had my good camera with me. Clockwise: aji sauce, maracuya (passion fruit juice), Kola Inglesa, chicha morada (purple corn drink spiced with cinnamon, clove, pineapple, and sweet pepper). 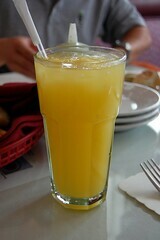 All drinks were $1.95 each. 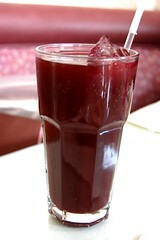 I loved my chicha morada! 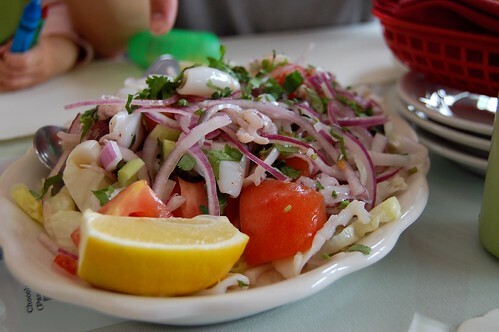 Ensalada de calamares ($10.95). Nice and tangy. The calamari was fresh with a good snap, but the dish wasn't my favorite. Not my order, and I wouldn't order it again if I had the choice. Chicharron de pescado ($10.95). Crunchy golden fish bites? With criolla salsa? Yes, please! Even Little Monkey Niece gobbled these up. We told her they were chicken nuggets. It's easy to trick three-year-olds. Tallarin de camaron y carne ($13.95). 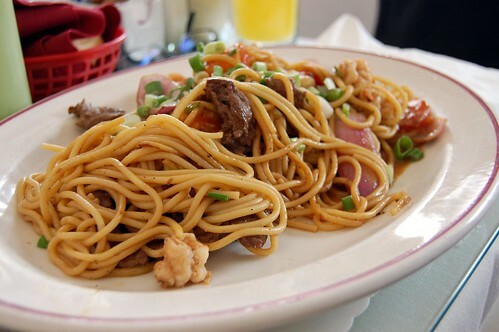 This stir-fried spaghetti with shrimp, beef, onions, and tomatoes was very Chinese-like. Yummers. 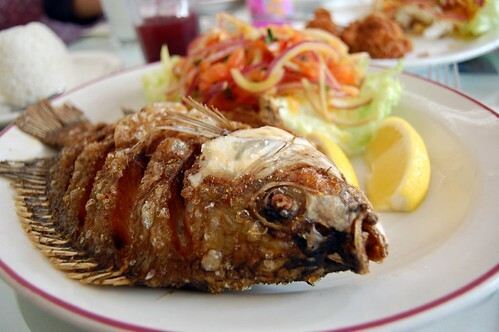 Mojarra frita ($11.95). I love whole fried tilapia! This guy looked straight at me and said, "I'm effing delicious!" A very self-aware fish. By the time we left, the place was completely packed. oooh, this place looks good! i love your line about the "self-aware" fish...cracks me up! There is nothing like a whole fried fish. The crunchy salty skin is to DIE FOR. Thanks for the morning drool session! I love the caption for the fish photo. "It's easy to trick three-year-olds." This was my favorite part. I'm guessing she didn't eat any of the the whole fried tilapia. the "it's chicken nuggets!" line used to work with the teen. one day, she realized it had the wrong texture. and now, she won't touch anything that swims. Mmmm...I'm going to miss eating at this place. Thanks to you I discovered it. I took one of the guys there to eat once so hopefully Mamita's will continue to be enjoyed after I'm gone. Hmm. Maybe I should eat there for lunch today. 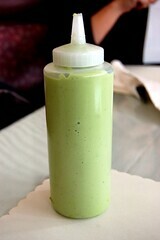 Any sauce served in a squeeze bottle is fine by me. 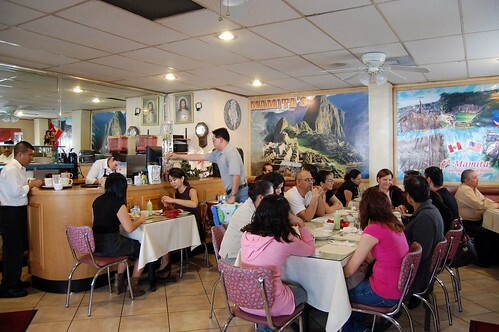 Peruvian food is pretty much always good. 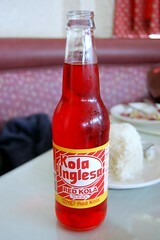 I never thought about it before I moved to Chile, and now it's up there in my favorite food ethnicities. I too loved that you tricked LMN into eating fish. Hopefully by the time she realizes that it's not chicken she also realizes that fish is yummy! 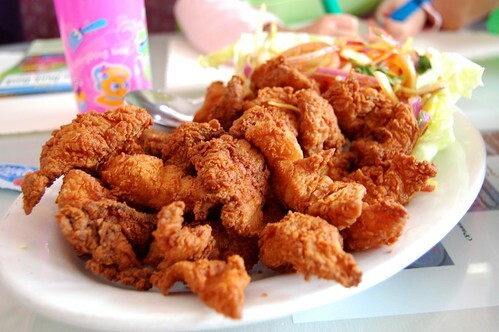 mmmm - I'm all over anything fried. especially fish. Not gonna lie. That fish really creeps me out. i want some of those fish bites. and the fried whole fish. i could eat on aji alone. Other than very fresh fish, the food in Peru was not very noteworthy. Another Lomo Saltado? No thanks. Then again, the food looked nothing like the deliciousness in these pictures. Mmmm, fish. Ewww that fishy picture ewwwww! Holey crap - did you eat the head? You're brave. I have yet to try this place and it's so close to my 'hood.